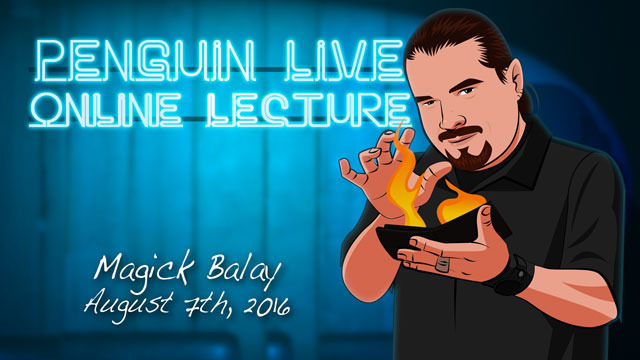 Today, when you order "Magick Balay LIVE", you'll instantly be emailed a Penguin Magic gift certificate. You can spend it on anything you like at Penguin, just like cash. Just complete your order as normal, and within seconds you'll get an email with your gift certificate. 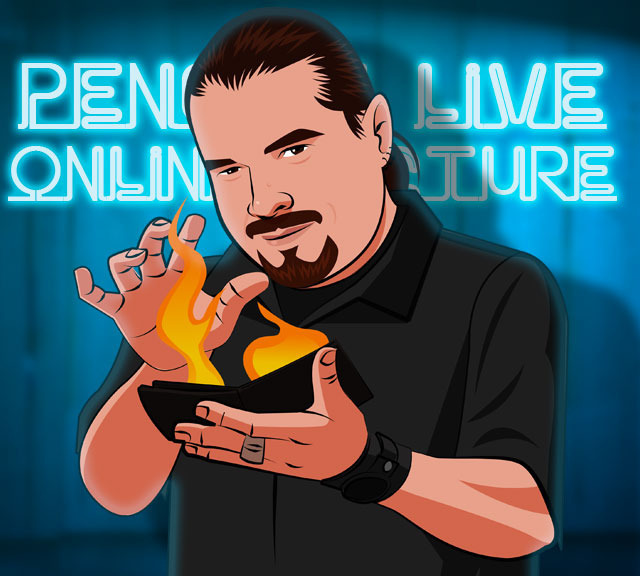 Magick Balay LIVE (Penguin LIVE) Find out why David Roth calls this man "The greatest magician I know". SUPPORT LIVE MAGIC. DOWNLOAD THE FULL LECTURE TODAY. Magick Balay is a world-renowned close-up magician. Based out of New York City, Magick has entertained audiences across America for over two decades. He has consulted for multiple magic manufacturers and has been the head demonstrator at every professional magic company in Manhattan. You can catch Magick in his show “Close Up Kings” on the Syfy channel in the US, Discovery International in Europe, or OLN in Canada. Magick has also released two top selling DVD’s, “Centrifugal” & “Four Quarters”, and has been featured in many others such as Reel Magic, International Magician Society (Gold Series & Pro Series), Marco Tempest Virtual Magician, etc… Magick has also performed in several top venues including the Magic Castle in Los Angeles. 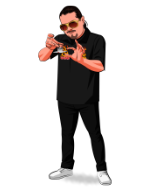 Magick is a highly sought after private entertainer and has had the privilege to perform for the likes of Michael Jackson, Wayne Gretzky, Britney Spears, Christopher Reeves, Derek Jeter, Neil Patrick Harris, Michael J. Fox, Edward Norton, Spike Lee, Lorne Michaels, and many, many more. If you've never been to a magic lecture, there's never been a better time. Sunday, August 7th, at 7:00pm, we're streaming Magick Balay LIVE in a spectacular 2-hour online lecture. Watch and learn things you won't find in any book or DVD. Purchase the Magick Balay LIVE product. This is your ticket. On Sunday, August 7th, anytime before 7:00pm Eastern, click the MyPenguinMagic area at the top of the Penguin site. You'll see the livestream appear 1 hour before showtime. At 7pm sharp, Magick will hit the stage and begin his JAM-PACKED professional lecture. smooth handling of even the most basic effects. He is a living legend of NYC magic and I'm looking forward to anything and everything that he shares on this lecture. If you've never been to the magic shops in NYC that Magick performs demonstrations in or had a lucky chance encounter with him in a bar you really should check out this lecture. It'll encourage you and entertain you. definitely loves magic. it's contagious to his audience. he didn't do anything novel. just a lot of classic bar magic. if you are looking for material to do at your restaurant this is the lecture for you. i am at a point in my career where i am looking for crazy new material to keep me interested or a new tip on how to grow my magic business. that is not what this lecture is about. recommended you purchase this. Magick is the best. Every time I chill with him I always learn something new. And I'm not writing this review because I'm his friend. I'm writing it because from the times that I chill with him at the bar he just shows me good trick after good trick. Then he turns around and does them to people and they get reactions like you wouldn't believe. He should be called king of bar magic. Because he is simply the best. If you are looking for the coolest new magic gimmick don't waste your time on silly gimmicks. Because you Will learn how to get better reactions with the simplest of props. I predict the lecturer will get nothing but 5 star reviews. Congrats magick! And enjoy fellow magicians! I own around 20 to 25 Live lectures with some big-time names like Greg Wilson, Michael Ammar & many more amazing magicians. However Balay performs like a beast and his magic flows like I've seen no other replicate. He takes some old favorites that we all know & love and he makes you want to bring them back out again after seeing his routines and how he pieces it all together flowing from one trick to another. Please Penguin invite Magick back for round 2!!! As a matter of fact I'm about to watch this lecture again, it really is that entertaining. The magic isn't earth shattering, but the dialect & patter he shares with his performance and how to flow from one trick to another is invaluable compared to any knuckle-busting maneuvers and fancy sleight-of-hand. This is an extremely entertaining lecture, and very helpful in learning how to perform, interact with your audience & flow with your magic. Can't wait to see him come back again!! This lecture taught me a lot! It further proved to me that you don't have to pull out all the fancy stuff to entertain people! We as magicians forget that we are performing magic for PEOPLE, not ourselves or other magicians. Simple sells! Just because it is "easy" doesn't mean that it isn't effective! Even if you are a seasoned pro, I would recommend this lecture. Don't read into those reviews where people are saying "stuff you already know." Sure, you might know a lot of stuff in this lecture. I did, but now I have a new found appreciation for the simple things. He even shows you real life examples for everything he teaches! So you know it works. I recommend this to everyone out there interested in close up magic. Solid stuff and great to see different perspective on things. Add to cart now! It doesn't get old to see Magick perform and teach. His style of teaching is fun and easy. He is a master at his craft and I can say personally is because of Magick that I became a magician myself. I hope Penguin brings him back for a second lecture, he is well worth the price! Excellent...good powerful,commercial magic....tricks that probably you know,but do not perform,but now you can using the great advise "Magic touch"Balay's touch.I have the pleasure of expend many hours of magic time with Magick..and he always amazed me....knowing magic for at least 20 years,, I assure that his routines "Kills". His attention to details and to make the difficult easy to understand will save you frustrations . I just had to give him it, I just had to. He with no lie made me finally do a bill switch and actually made me start trying to use a TT. I would really love to thank him for making me start really using my TT that I gave up cause I thought I sucked but he encouraged me to start going to it. Magick is a great demo man and a great walkaround/bar magician. What you will see in this lecture is material that you have heard of and perhaps done yourself, but the touches that he offers shows that he has done this material many, many times. Sometimes what we need is not new tricks, but a touch or premise for an old chestnut. This is some great material. Warning, there is some adult language but it flows by pretty quickly for the most part. Certainly worth the cost for anyone who works walkaround.